Vancouver, British Columbia – Luminex Resources Corp. (TSXV: LR) (US OTC: LUMIF) (the "Company" or "Luminex") is pleased to announce that it has finalized the layout of an exploratory 4,500 metre diamond drilling program at its Orquideas earn-in project with First Quantum Minerals, located in the province of Zamora-Chinchipe in southeast Ecuador. The Company has applied for drilling and water permits and drilling operations should commence following approvals, currently anticipated for the first half of 2019. First Quantum Minerals and Luminex geologists compiled and analyzed data generated from over 2,500 surface geochemical samples, mapping of lithology, structure and alteration, as well as interpretation of legacy aeromagnetic data and an Induced Polarization (IP) survey over 42.6 line kilometres. This work resulted in the definition of the eight planned drill holes. The Orquideas porphyry copper project comprises a coincident copper-molybdenum geochemical anomaly extending 5.5 x 2 km trending northwest to southeast. 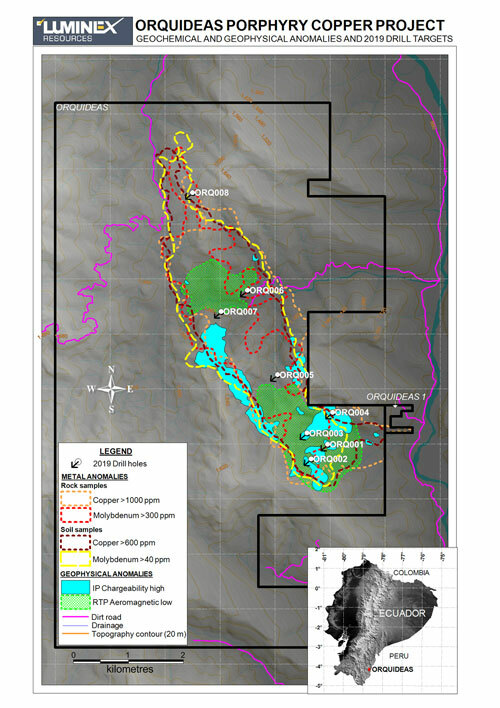 Mineralized outcrops assaying up to 0.9% copper and 0.66% molybdenum are hosted in variably altered intrusive rocks of the Zamora Batholith, a known host of major porphyry copper/gold deposits such as Mirador, located 67 km to the northeast. This large geochemical anomaly contains four distinctive target areas, each with its own defining attributes; namely, the northern, central, south central and southern areas. The 4,500 metre drill program will test each target area, starting from the most prospective southern target and progressing northwards. Certain statements and information herein, including all statements that are not historical facts, contain forward-looking statements and forward-looking information within the meaning of applicable securities laws. Such forward-looking statements or information include but are not limited to statements or information with respect to the receipt of permit approvals for drilling operations, timing of commencement of the 4,500 metre drill program, completion of the drill program, and that the drill program will test each target area. Often, but not always, forward-looking statements or information can be identified by the use of words such as "will", "should" or variations of those words and phrases or statements that certain actions, events or results "will" or "should" be taken, occur or be achieved.